Crops don’t grow well several years in a row in the same soil. Therefore their place in the garden has to be changed – rotated. This enables an even usage of nutrients from the soil and slower spreading of disease and pests. The main rule of crop rotation is: each year a crop from different botanical family should grow in the same bed. BEAN FAMILY – FABACEA: Fabacea include legumes (beans, peas, broad beans, chickpea, soybean, lentils), clover, lucerne etc. They improve the soil fertility and soften it. They are often used for green fertilization. CRUCIFERS: It is good to plant the cruciferous vegetables after the bean family crops, as they use a great amount of nutrients from the soil. They need a long rotation period of 5 years. The cruciferous family includes the brassica vegetables (cabbage, cauliflower, Savoy cabbage, broccoli etc. ), turnip, kohlrabi, black radish, radish, rucola, rapeseed, white mustard etc. NIGHTSHADES – SOLANACEAE: They are not sensitive to a short period of rotation; two years in enough for them. Solanaceae include tomato, pepper, eggplant, potatoe etc. CARROT FAMILY – APIACEAE: Their rotation period is three or four years. Don’t fertilize with barn or liquid manure. This family includes carrot, parsley, celery, coriander, fennel, cumin etc. SPINACH CROPS: They need a long period of rotation. This family includes spinach, Swiss chard, beetroot, garden orach, quinoa etc. ASTERALES: At least 3 years of rotation period. They include lettuce, radicchio, endive, dandelion, black salsify etc. CUCURBITS: 3 years long rotation period is enough. Cucurbit crops like barn manure. They include cucumbers, zucchini, squash, watermelons, melons etc. BULB VEGETABLES – GEOPHYTES: At least 3 years long rotation period. Barn manure or other organic nutrients are not good for them. They include onion, garlic, shallot, leek, chives etc. Legumes and bulb vegetables are not compatible and must never be planted one after another. Some of the good combinations include: cruciferous vegetables after legumes, Brussels sprout after potato, peas after cruciferous vegetables, spinach or celery after potato, cauliflower after celery, beetroot after lettuce or early kohlrabi, onion after cruciferous vegetables or carrots. Plant flowers to your garden as well; especially tagetes, calendula and Indian cress. Avoid gladioli and dahlias. 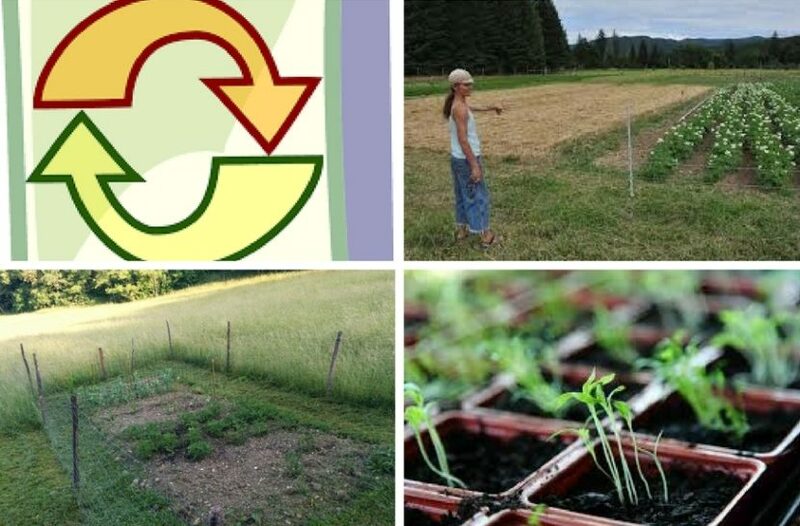 Make a plan for crop rotation during winter, when your garden is empty. Divide the crops into three groups according to their needs of nutrients. Divide the garden into three parts: demanding (brassica and fruit vegetables), less demanding (root vegetables, apiaceae – carrot family, leek, pole beans), non-demanding (lettuce, bulb vegetables, bush beans and other low-growing legumes). The fertilizing plan should be adjusted accordingly: fertilize the demanding crops with barn manure or purchased fertilizers according to the instructions; less demanding crops with compost or a half-amount of purchased fertilizers, and do not fertilize the non-demanding ones. Include the crops for green fertilizing in the rotation as well. A 4-year rotation plan is good as well, where we leave one fourth of the soil resting and plant the green fertilizing crops there. The rotation period does not have to play out exactly – at least when it does in the majority of cases. The most simple rotation plan is to plant according to the parts of the crops that we eat: first fruits or seeds, then flower vegetables (cauliflower, artichoke etc. ), then leafy vegetables and lastly root/tuber vegetables. If you have trellis for high-growing crops, plant only along one half of the trellis, and low-growing ones along the other half. Swap the halves the following year to get a two-year rotation period in one garden bed. The first field is planted with crops that use the most nutrients. Fertilize with barn manure during fall in harder soil or a great amount of organic fertilizers. This field must include brassica vegetables (cabbage, cauliflower, Savoy cabbage, kohlrabi). Additional crops that can be planted here: squash, zucchini, cucumbers, eggplant, melons, watermelons, early potato and spinach. The second field follows the first one (it was fertilized with barn manure the previous year). You can fertilize more modestly here with purchased organic fertilizers and add some mineral nutrients. Use home garden compost as well. Plant overwintering plants here: lettuce, Brussels sprouts, lamb’s lettuce, spinach, leek, Swiss chard. During the year plant: kohlrabi, radicchio, endive, tomato, pepper, beetroot, celery, rutabaga, turnip, leafy parsley, parsnip. Third field – stays unfertilized. Here plant: carrots, root parsley, onion, garlic, shallot, legumes. After the legumes you can again plant lettuce, endive, radicchio etc. in the same year. After three years, start the circle again.